A 59 year-old male who underwent a same-day bronchoscopy with transbronchial biopsies taken for diffuse parenchymal lung disease presents later that afternoon to the Emergency Department with a chief complaint of shortness of breath. Upon arrival he is noted to be mildly tachypneic with a respiratory rate of 22. He is not hypoxic and the remainder of his vital signs are within normal limits. Exam reveals diminished breath sounds in the left lung fields. An upright chest x-ray demonstrates a large left-sided pneumothorax (Figure 1). The conventional treatment of a spontaneous or iatrogenic pneumothorax is with a small-bore thoracostomy tube also known as a pigtail catheter. This usually requires connecting the patient to an underwater seal device such as a pleuravac, thereby necessitating admission to the hospital for monitoring. However, there are other devices available to treat this condition that can be deployed more rapidly and with similar success rates. In some cases, patients treated with these devices do not even require hospitalization. One such device is the Tru-Close thoracic vent. The Tru-Close (also referred to as a Thora-Vent) is a portable device that consists of an 11 or 13 French catheter connected directly to a small air chamber containing a one-way valve and self-sealing port. Using either an over-the-wire Seldinger technique or a trocar for direct insertion, the catheter is inserted using local anesthetic and sterile technique into the affected side at the patient’s second intercostal space on the mid-clavicular line (similar in location to where one would needle decompress a tension pneumothorax). The entire device is then affixed to the chest wall with adhesive wings. It can be left to air seal or connected to suction if clinically indicated. Time to complete the entire procedure from beginning to end takes around one minute (a video with more information on The Tru-Close, as well as the procedure for placement can be found here). The literature on the use of thoracic vent devices in treatment of pneumothorax is limited. In one study of 18 patients (15 with spontaneous pneumothorax and 3 with iatrogenic pneumothorax), 88.9% of patients (16/18) treated with a Tru-Close thoracic vent had complete lung re-expansion within 24 hours. All of the patients with spontaneous pneumothorax were discharged to follow up as an outpatient. There were no immediate complications, and most patients remained recurrence free during a three-year follow up period. It is important to note that in this study, the device was inserted under fluoroscopic guidance, something that is not readily available to most emergency physicians. In another study of 30 patients comparing thoracic vent devices to conventional intercostal tube drainage, the authors found that there was no significant difference in the rates of lung reexpansion or complications between the two groups. They did find that patients treated with the thoracic vent devices needed significantly less analgesics than patients treated in the conventional manner. Furthermore, 70% of patients treated with a thoracic vent were managed as an outpatient, whereas all patients treated with the conventional intercostal tube required admission. This literature suggests that in reliable, otherwise healthy patients who present with an uncomplicated spontaneous pneumothorax, the use of a thoracic vent device for lung reexpansion may be a good option that could potentially enable the patient to be discharged and managed as an outpatient provided they have close follow-up. Patients generally tolerate the device well as allows maximum ambulation while device in place. A Tru-Close thoracic vent is placed in the emergency department, and a repeat chest x-ray demonstrates rapid resolution of the pneumothorax (Figure 2). The patient is admitted to the medical service due to a persistent air leak. He has an uneventful hospital stay and is discharged on hospital day 3. Figure 2: Interval resolution of left-sided pneumothorax after placement of a Tru-Close thoracic vent. Kim et al. “Effectiveness of Ambulatory Tru-Close Thoracic Vent for the Outpatient Management of Pneumothorax: A Prospective Pilot Study.”Korean J Radiol. 2017 May-Jun;18(3):519-525. doi: 10.3348/kjr.2017.18.3.519. Epub 2017 Apr 3. Roggla, et al. “The management of pneumothorax with the thoracic vent versus conventional intercostal tube drainage.” The Central European Journal of Medicine. 1996;108(11):330-3. Tsuchiya et al. “Outpatient Treatment of Pneumothorax with a Thoracic Vent: Economic Benefit.” Respiration. 2015;90(1):33-9. doi: 10.1159/000381958. Epub 2015 May 12. A 26 year-old male presents after a motorcycle accident. He was the helmeted, single-occupant of a motorcycle that crashed into the back of a stopped car. There are no external signs of injury, but he believes his neck may have hit the handlebars as he was thrown from the bike. He denies loss of consciousness. His only complaint is that his voice sounds hoarse and he is having difficulty swallowing. He denies any intoxicants. The patient has a normal primary traumatic survey. His secondary survey is notable for crepitus of the anterior neck. No chest wall crepitus is noted. No stridor or bruit is appreciated on anterior neck auscultation. There is no cervical hematoma or ecchymosis. There is no midline C-spine tenderness. There is no blood in the oropharynx. His voice is raspy, but he is able to phonate and adequately handle his secretions. He has no other traumatic complaints or physical exam abnormalities on secondary survey. A chest x-ray is without any evidence of pneumothorax. You wonder what imaging should be performed next. Does he need a CT brain based on his history? Does crepitus count as a distracting injury? Should he have a CTA in the absence of any hard vascular signs? After discussion with the trauma team, CT imaging including a CTA neck is performed (Figure 1). 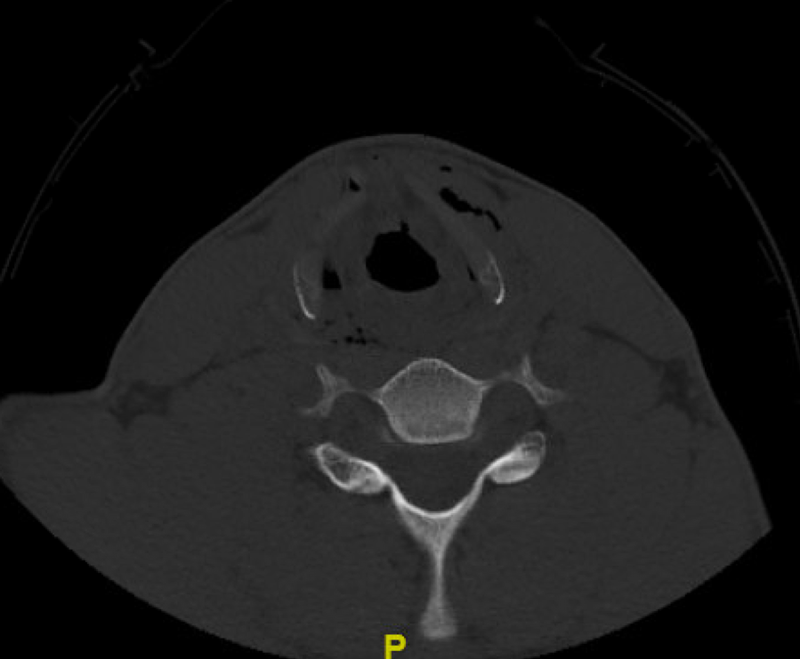 Figure 1: Non-contrast portion of the CTA neck. CT imaging reveals a left hyoid bone fracture, as well as a comminuted fracture of the right thyroid cartilage. His CTA is normal. He has no intracranial injuries, face or C-spine fractures. There is considerable soft tissue emphysema. Blunt laryngeal trauma is rare. The reported incidence of laryngeal fractures is 1:30,000 patients presenting to the ER. The low incidence is secondary to the relative protection by adjacent bony structures (the mandible, manubrium, and vertebral bodies). Furthermore, humans are equipped with a protective reflex to flex their heads downward when startled, further shielding this vulnerable region from trauma. Laryngotracheal injury occurs when patients lose their ability to protect this area, and are most commonly associated with motor vehicle accidents, when a hyperextended neck strikes a fixed object (steering wheel, dash board). Recreational vehicles are also increasingly implicated (motorcycles, four-wheelers striking branches). Other mechanisms of injury include strangulation, assault, or hanging. The patterns of injury vary depending upon the age and gender of the patient. Women are at increased risk for subglottic and cervical tracheal injuries owing to their tendency towards longer necks. The thyroid and cricoid cartilage also ossify as part of the normal aging process (typically beginning around age 18-20), and for this reason, elderly patients are at increased risk for comminuted fractures of these structures. Conversely, children have flexible cartilage and are much less likely to sustain laryngeal fractures. The larynx consists of a cartilaginous skeleton, the intrinsic and extrinsic muscles, and a mucosal lining. The cartilaginous skeleton houses the vocal cords. It consists of the thyroid cartilage, the cricoid cartilage, and the paired arytenoid cartilages. The thyroid cartilage is connected superiorly to the hyoid bone. The extrinsic muscles connect the cartilage of the larynx to other structures of the head and neck (i.e. sternothyroid muscle, etc.). The intrinsic muscles alter the shape, tension and position of the vocal cords (Figure 2). Figure 2: Anatomy of the laryngotracheal complex. Injuries range from mucosal hematomas and lacerations to fractured cartilage. The most severe laryngeal injury is complete laryngotracheal separation (Figure 3). Classification of these injuries will be covered in the Classification and Definitive Management section. Figure 3: Types of laryngotracheal injuries. The mechanism of injury is important. The provider should take careful consideration of any history which lends itself to the possibility of “clothesline” type injury, namely forced hyperextension and forward propulsion or direct trauma to the anterior neck (strangulation, hanging). Patients will report dysphonia, odynophagia, dysphagia, neck pain, dyspnea or hemoptysis. Studies suggest that hoarseness is the most common presenting symptom of laryngeal trauma. Juutilainen et al reviewed 33 cases of external laryngeal trauma, and 28 (85%) of those cases presented with hoarseness. Physical exam may reveal stridor, dyspnea, ecchymosis, subcutaneous emphysema, hemoptysis, loss of the thyroid prominence or drooling. However, it is important to note that no single symptom correlates with injury severity and the absence of these findings does not exclude the possibility of laryngeal injury. Airway management is crucial. If a patient with a suspected laryngeal injury has no evidence of respiratory distress or airway compromise, proceed with a standard traumatic work-up. If the airway is not patent (respiratory distress, airway obstruction, stridor, not handling secretions, hypoxic), establishing an airway becomes a priority. In these cases, tracheotomy is preferred to endotracheal intubation, as intubation can exacerbate laryngeal trauma and precipitate complete obstruction. It can also be extremely challenging to intubate because of distorted anatomy and poor visualization, with a risk for passing the ET tube through a false lumen created by the trauma. Furthermore, adequate positioning can be challenging if there is associated maxillofacial injuries and/or the need for C-spine precautions. That being said, there is no absolute contraindication for endotracheal intubation and if the patient is crashing, the most experienced airway provider should attempt it. Again, most of the otolaryngology literature favors tracheotomy, but if palpation of the larynx reveals continuity of the thyroid cartilage and cricoid cartilage, cricothyroidotomy can be performed if it is the only available, expedient airway. Importantly, laryngeal trauma carries a high risk of concomitant injury. There is a 13-15% incidence of associated intracranial injuries; skull base and facial fractures are seen in approximately 21%; C-spine fractures are seen in 8%; and esophageal/pharyngeal injuries occur in approximately 3% of these cases. Thus, it is best to have a low threshold for additional imaging studies. CT is the imaging modality of choice, but should only be undertaken in those patients with a stable or secured airway. There is no definite literature on the utility of CTA in blunt laryngeal trauma, but if a patient has any hard signs of vascular injury (bruit/thrill, expanding hematoma, pulse deficit) or signs of an acute ischemic stroke, there should be significant concern for an associated vascular injury. The Schafer-Fuhrman Classification scheme has been created to characterize laryngeal injuries. This classification scheme relies on both CT imaging and direct visualization. As part of the work-up for laryngeal injury, flexible fiberoptic laryngoscopy should be performed, usually by otolaryngology. During laryngoscopy, care should be taken to observe for any deformities, edema, hematomas, lacerations, exposed cartilage and partial or complete vocal cord fixation (suggesting a recurrent laryngeal nerve injury). There is no definite recommendation for the work-up of esophageal injury. In some instances, esophageal injury can be seen on CT imaging (paraesophageal stranding or gas, lumen communicating with gas/fluid). If, however, the suspicion for esophageal injury is high, additional studies can be pursued, beginning with a gastrograffin swallow study, followed by a dilute barium swallow for more complete evaluation. The definitive management of laryngeal injuries depends on the injury pattern. Group I and some Group II injuries can be conservatively managed. This generally consists of humidified air, voice rest, head of bed elevation, steroids, anti-reflux medications, and antibiotics. Patients will often be admitted to the ICU for the first 24-48 hours given the potential airway compromise. They may undergo serial laryngoscopy for daily injury surveillance. Group III-Group V injuries require operative intervention. These are the injury patterns that usually undergo tracheotomy. Group V patients always have tracheotomies and represent a significant surgical challenge. Notably, there are multiple operative approaches and interventions for laryngeal trauma that are beyond the scope of this post. The patient was seen and scoped by otolaryngology in the ED. This showed a supraglottic hematoma, but no lacerations or exposed cartilage. His vocal folds were mobile. He was admitted to the trauma ICU, where he underwent a negative barium swallow, and ultimately, did not require operative intervention. Becker M, Leuchter I, Platon A, Becker CD, Dulguerov P, Varoquaux A. Imaging of laryngeal trauma. Europeal Journal of Radiology. Jan 2014: 83(1):142-154. Eller RL, Dion G, Spadaro E. Management of Acute Laryngeal Trauma. http://www.cs.amedd.army.mil/FileDownloadpublic.aspx?docid=a1ab55ed-56b2-4a65-ade1-666e80a582cf. Accessed on 12.05.07. Font JP, Quinn FB, Rayan MW. Laryngeal Trauma. http://www.utmb.edu/otoref/grnds/laryng-trauma-070328/laryng trauma-070328.pdf Accessed on 12.05.17. Jalisi S, Zoccoli M. Management of laryngeal fractures—A 10-year experience. Journal of Voice. Jul 2011;25(4):473-479. Jewett BS, Shockley WW, Rutledge R. External laryngeal trauma analysis of 392 patients. Archives of Otolaryngology–Head & Neck Surgery. Aug 1999;125(8):877-880. Juutilainen M, Vintturi J, Robinson S, Bäck L, Lehtonen H, Mäkitie AA. Laryngeal fractures: clinical findings and considerations on suboptimal outcome. Acta Otolaryngol. Feb 2008: 128(2):213–218. Murr AH and Amin MR. "Laryngeal Trauma"In CURRENT Diagnosis & Treatment in Otolaryngology - Head & Neck Surgery, 2nd Edition Ed. by Anil K. Lalwani. Mendelsohn AH, Sidell DR, Berke GS, John MS. Optimal timing of surgical intervention following adult laryngeal trauma. Laryngoscope. Oct 2011;121(10):2122-2127. Schaefer N, Griffin A, Gerhardy B, Gohchee P. Early Recognition and management of Laryngeal Fractures: A Case Report. Ochsner J. 2014: 14)10):264-265.